Darwin started his work on his theory of natural selection. It was a long hardworking process. Darwin wanted to convince him that change occurs over time. Darwin accepted the opinion of most scientists before starting voyage. These opinions say that the earth and its inhabitants were created 6.000 years e.g They had not changed since then. Darwin made important observations during his voyage. These observations suggested that change does occur. 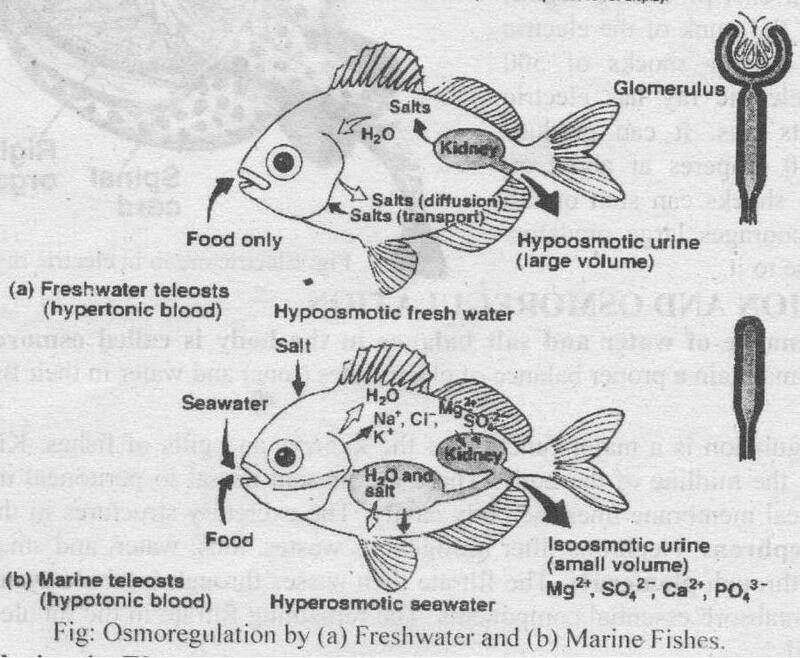 He also realized that the organism arose through gradual changes. But the diversity of modern species could not form in 6,000 years. Thus Darwin developed the ideas of change in his mind. He studied this idea for 20 years. Then he gave the mechanism of this change. Darwin died without knowing the genetic principle. The e principles supported his theory. The face of the earth changed gradually over long periods. Therefore, living fo ms also changed gradually during this period. The astrological dead remains of the organism or their imprints preserved in the rocks are called fossils. The HMS Beagle reached South America. Darwin dug the dry river beds of the pampas (grassy plains) of Argentina. Darwin found two types of fossils. (a) Fossils different from other animals: He -found the fossil of an extinct hippopotamus like animal. It is now called Toxodon. He also found fossils of horse like animal, Thoantherium. Both of these fossils were animals. They e clearly different from any other animal living in the region. Modern horses were present in South America. But Spanish explorers brought these ho es to America in the 1500s. The fossils suggested that horses were present and became extinct long before the 1500s. (b) Fossil similar to other animals: Darwin also found fossils of giant armadillos and giant sloths. Darwin also found similar fossil in the region. Th y had different size. But they were very similar to each other. formed by catastrophic events. One of the catastrophic events was Noah’s flood. But Darwin believed that fossil were evidence of the change of species composition, of the earth. Some species became extinct without leaving any descendants. Others became extinct. But they give rise to new species before their extinction. The HMS Beagle stopped at the Galapagos Islands. These islands are present in the western shore of South America. They are named after the large tortoises (Sp. galapago, tortoise) that inhabit there. The tortoises weigh up to 250 kg. They have shells up to 1.8 m in diameter. They live far 200 to 250 years. The governor of the islands told Darwin that the shapes of the tortoise shells were different in different parts of Albemarle islands. Darwin also noted some other differences. .Tortoises from the drier regions had longer necks. But the tortoises from wetter habitats have smaller necks. But still the tortoises were .quite similar to each other. They were also similar to the tortoises on the mainland of South America. There should be some reasons of their similarities. Darwin explained that a few ancestral animals travel from the mainland. They covered about 900 km of ocean. The reached the Galapagos. They gave rise to the fauna of island. But the Islands are volcanic. They arose out of the seabed. Therefore, no and connection’ with the mainland exists. There is one modern hypothesis. According to this hypothesis the tortoises floated from the mainland on mats of vegetation. Vegetation regularly break from coastal river banks during storms. There were no predators on the island_. Therefore, the, tortoises gradually increased in number. Darwin found two types of tortoises. They were found in different regions. Darwin explained, the differences in their distribution. (a) Tortoise p with longer necks: They were found in the dry regions. There was little vegetation in the dryer regions. Therefore, the tortoises with longer necks have advantage in this region. They can reach higher to get food. Therefore.. this region favors tortoise with longer necks. (b) Tortoises with shorter necks: They.live in moister regions. This region does not favor tortoises with longer necks. Therefore, the shorter-necked tortoises survive in these regions. Galapagos finches were sparrow like birds. 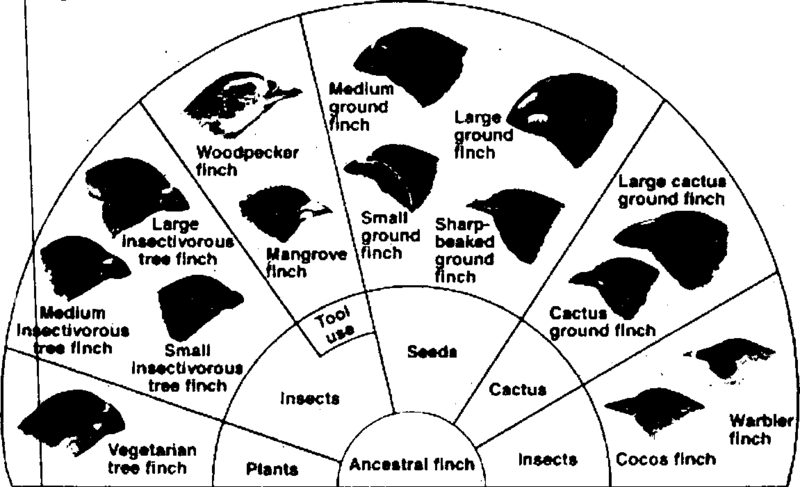 Darwin studied different types of finches. Darwin noticed that the Galapagos finches have common ancestry. Scientists now think that the ancestor of finches -inhabited the mainland of South America. These ancestors gave rise to Galapagos finches. Some finches arrived in Galapagos Island. They.form single or multiple colonization. They set up the first bird populations on the islands. Early finches lived in many different habitats. These habitats were without other birds and predators. Ancestral finches were seed eaters. They multiplied rapidly and filled the seed-bearing habitats. Fourteen species of finches arose from this ancestral group. One of them was found on small Cocos Island. This island is present northeast of the Galapagos Islands. Each species is adapted to a specific habitat on the islands. These finches had difference in the size and shape of their bills. 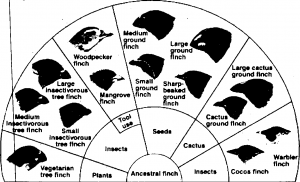 It relates to different dietary adaptations in these finches. The finches of the Galapagos Islands provide an example of adaptive radiation. The formation of new forms from an ancestral species in response to the opening of new habitats is called adaptive radiation.